I have a blog on the STOP Obesity Alliance website on the latest research on the effectiveness of public policy interventions to prevent obesity. Of the putative causes of obesity, one of the strongest and most consistent is maternal obesity. But maternal employment has also been implicated in a number of studies over the last few years. While not proving causation, the dramatic increase in childhood obesity since the 1970’s, coincides with an equally dramatic rise in female participation in the workforce who had children under the age of 18. This rate rose from 47.4% to 71.2%. Are these two phenomenon related? It’s a good question. Putting two graphs next to each other doesn’t prove one affected the other. Recent studies have shows an increased likelihood that children of working mothers are more likely to be overweight than those of non-working mothers. A systemic review of OECD countries found evidence indicating the working mothers were somewhat more likely to have overweight children. PubMed: Maternal Employment Childhood Health Effects in OECD countries. A large study in the United Kingdom found that any maternal employment after birth contributed to the likelihood the child would be overweight. PubMed: Maternal Employment and early childhood obesity UK Millenium Study. Moms are not likely to be surprised that the evidence shows that Dad’s employment or hours worked do not correlate to a child overweight, presumably because they spend less time in cooking, food preparation, and child care to begin with. But the question still remained, does maternal employment result in less time spent in activities directly related to a child’s diet and physical activity or a reduction in other activities. So John Cawly and Feng Liu undertook to research this question, utilizing an extensive database, the American Time Use Study (ATUS). They found that, on average, working mothers spent 277 minutes a day with children; 410 minutes for non-working mothers. Working mothers were less likely to spend any time grocery shopping, cooking, eating with children, child care and supervising children. Among women who spent any time in these activities, the average number of minutes spent was consistently lower for working than for-non-working mothers. According to the authors, “The one exception to this general pattern is that working mothers are significantly more likely to report spending any time purchasing prepared food.” Roughly 20% of both working and non-working women with children spend 0 minutes with children a day. More specifically, 8 hours of employment is associated with women spending 7 fewer minutes grocery shopping, 23 fewer minutes cooking, 18 fewer minutes eating with children, 14 minutes fewer minutes playing with children, 51 fewer minutes caring for children, and, 5 fewer minutes supervising children. The time deficits are roughly twice as large for women with a husband or partner than for single mothers. There was no significant difference in the time spent with children by husbands whose spouse worked or did not work. Overall, fathers appear to offset less than 15% of the decrease in time that working mothers spend with their children. Even non-working men pick up only about 1/3 of the slack. Other research in this field indicate that children of working mothers have fewer formal meals, more food consumed grazing, more prepared foods, more time spent watching television, and more time unsupervised. Moms are not having a picnic either. The Cawley study found that, compared to non-working mothers, working mothers spent 48 fewer minutes per day watching TV, 31 fewer minutes sleeping, 17 fewer minutes at leisure and 16 fewer minutes socializing. As I write this, the airwaves have political ads calling for tougher restrictions on welfare payments (which go to mothers with children), specifically more rigorous work requirements. This study may indicate that there are long term consequences for such policies in terms of maternal and child health. Other policies, including those affecting food labeling and school physical activity should be re-evaluated. Back in the 1970s, there was a lot of debate over whether mothers should work at all. This was seen as some discretionary. We are a long way away from that time. For the vast majority of working mothers, have the additional income is essential to the whole family survival. Just a word about the American Time Use Study: This database, maintained by the Department of Labor, Bureau of Labor Statistics (http://www.bls.gov/tus/) is, in my opinion, underutilized in obesity. Predictably, we hear recommendations that people should just change their lifestyle, spend more time, like 30-60 minutes a day in physical activity, more time buying fresh foods, cooking wholesome foods, turning off the TV to do some activity, etc….Well, the ATUS provides some average time usage by adults. For weekdays: Personal care activity 9.24 hours, eating and drinking 1.19 hours, household activities 1.63 hours, purchasing goods and services, .69 hours, caring for household members .54, comparing for non-household members .20 hours, working and work related activities 4.49 hours, educational activities .60 hours, organizational, civic and religious activities 0.25 hours, leisure and sports 4.73, telephone calls, email, .16 hours. The point is, when asking people to make changes in their diets and physical activity, we have to ask “where is this time going to come from?” It has come from other activities? Taking care of Grandma? Volunteering at church? What? Just giving ‘good advice’ is not enough when so many Americans are living such stressful lives when free time is in short supply, especially for working moms. WASHINGTON – Taming the obesity epidemic in this country needs an all-hands-on-deck strategy so that schools provide students 60 minutes of physical activity daily, fast-food restaurants offer healthier fare for kids, and communities build recreational spaces that encourage physical activity, says a new report out Tuesday. 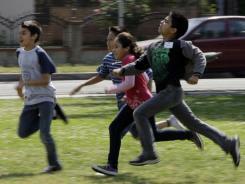 By Reed Saxon, APA new report recommends kids have 60 minutes of active time per day. A new report recommends kids have 60 minutes of active time per day. It’s going to take “bold actions” like these and a full-scale effort across all segments of society to reduce the obesity epidemic, says the report from experts convened by theInstitute of Medicine, which provides independent advice on health issues to policy makers, foundations and others. The goals and some of the strategies were presented here at the Centers for Disease Control and Prevention’s “Weight of the Nation” meeting, where experts are discussing ideas for the prevention and control of obesity. Currently, two-thirds of adults and a third of children in the USA are overweight or obese, government statistics show. Another study out Monday predicted that as many as 42% of adults may be obese, roughly 30 or more pounds over a healthy weight, by 2030 if actions aren’t taken to reverse the trend. Extra weight takes a huge toll on health increasing the risk of type 2 diabetes, heart disease, stroke, many types of cancer, sleep apnea and other debilitating and chronic illnesses, and it costs billions of dollars in extra medical expenditures. The Institute of Medicine committee reviewed more than 800 obesity prevention recommendations to pinpoint the most effective ones. Reporter Nanci Hellmich’s latest coverage on the obesity epidemic that is crippling the country. •Make it easier for people to work physical activity into their daily lives. For instance, people need to have safe places to be active including trails, parks, playgrounds and community recreation centers. •Create an environment where healthy food and beverage options are the routine, easy choice. Fast-food and chain restaurants could revise menus to make sure at least half of their kids’ meals comply with government’s dietary guidelines for moderately active 4- to 8-year-olds, and that those meals are moderately priced. Businesses, governments and others should adopt policies to reduce the consumption of sugar-sweetened beverages including making clean water available in public places, work sites and recreation areas. •Improve messages about physical activity and nutrition. The food, beverage, restaurant and media industries should take voluntary action to adopt nutritionally based standards for marketing aimed at children and adolescents, ages 2-17. If those standards aren’t adopted within two years by the majority of companies, then local, state and federal policymakers should consider setting mandatory nutritional standards for marketing to this age group. •Expand the role of health care providers, insurers and employers in obesity prevention. Employers should provide access to healthy foods at work and offer opportunities for physical activity as part of their wellness/health promotion programs. All health care providers should adopt standards of practice for preventing, screening, diagnosing and treating people who are overweight or obese. •Make schools a national focal point for obesity prevention. Students should have nutrition education throughout their school years, and kids in kindergarten through 12th grade should have the chance to engage in a total of 60 minutes of physical activity each school day. This should include participation in quality physical education. When it comes to food marketing to kids, “companies claim to be taking meaningful action, but still the overwhelming majority of food ads aimed at kids are for unhealthy foods,” she says. Most US middle and high schools sell soft drinks, candy and chips to their students. These practices have been widely criticized as contributing to childhood and adolescent obesity. However, a new study followed approximately 19,450 children from fifth to eight grade. Researchers found the children’s weight gain was not associated with the introduction or the duration of exposure to competitive foods. This did not vary by gender, race/ethnicity or family socioeconomic status. Possible explanations are that children’s food preferences and dietary patterns are firmly established before adolescence. Also, schools are highly structured whereas home life may have more opportunities for snacking. http://www.asanet.org/images/journals/docs/pdf/soe/Jan12SOEFeature.pdf. Gee, teen-agers want to eat junk food? Eating advice of experts and parents rejected? As concern about childhood obesity has increased, the school environment has received increased attention.